Super yummy coconut panna cotta surrounded by spun sugar. What could I do to lift a panna cotta up from its present state of being old school and overdone, I wondered? I've always wanted to make a sugar nest (spun sugar) but sugar and chocolate craft are very alien to me. Besides, I don't have a candy thermometer and the weather here is extremely humid. When I was in London last year, Tina, who reads my blog, contacted me and when we met, we got on like old friends and I even scored a stay with her and her hubby in their beautiful home near Heathrow Airport. Tina used to own a Peranakan restaurant in Singapore and she is such an excellent and super efficient cook that I felt embarrassed for myself. Last Saturday, Tina called me from London to confirm our date in December. She was excited for me about the Jelliriffic! challenge and when I told her how much I wanted to make a spun sugar nest but can't find a candy thermometer here, she offered to send me one but I couldn't wait so she insisted that I can make spun sugar without a candy thermometer, "just check for the soft ball stage". Thanks to her encouragement, I made spun sugar today and although the results are not as fine as I wanted, I'm very thrilled that I finally did it. There's more refinement to do but for now, I am happy that my first attempt was not a failure. It's people like Tina and many others (you know who you are!) who have kept me going with this crazy blogging hobby. After the photos were taken of the panna cotta walled by the sugar nest, I re-heated the sugar to shape another nest on the Jelliriffic! mould. It didn't work. The sugar pulled in drippy strands and worse, it stuck to the greased mould. I re-heated the sugar, wrapped the mould with foil, greased it, hoping to pull the foil off once the sugar hardened, but the sugar stuck again to the foil. I re-heated the sugar a couple more times and it was getting more and more burnt. In the end, I gave up but I'm sure that one day I will spin a sugar nest over the mould. It can be done. If you've never made panna cotta, make it! It's the yummiest easy dessert to make. 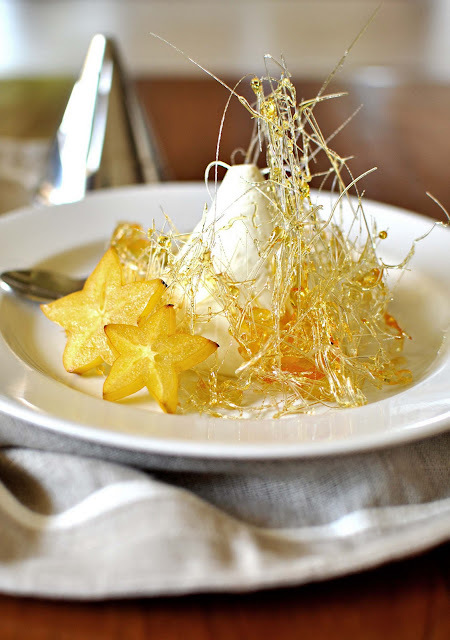 Just boil cream with gelatine, set it, make a sugar syrup or if you are adventurous, make spun sugar and you will turn a plain-looking dessert into a stunning showpiece. Try it and thank me. Plunge the pot into a bowl of cold water to stop the cooking and to cool and thicken the syrup. I worked in my back patio/outdoor kitchen. Fine strands of sugar ready for moulding into nests. Make sure to cover the floor with newspapers. I think that if my spun sugar strands were hair-thin, it'd be easier to mould them into a nest. 1. Soften the gelatine leaves in room temperature for a couple of seconds. Drain. 2. Put the cream, coconut milk and gelatine into a small pot and heat, stirring all the time, until the gelatine is melted. Do not let it boil. Remove, let cool for a few minutes and pour into a rinsed Jelliriffic! mould. Cover with wrap and chill until set. Put water and sugar into a small pot and heat (do not stir!) until it becomes golden brown (not too brown or it'll be bitter) and bubbly-thick. Very carefull, using a long ladle and gloved hand (because hot syrup will splutter), add about 50 ml of cold water dripping onto the inside of the pot. This is to prevent the syrup from hardening. Let it cool. If using gula melaka, pass the syrup through a fine sieve. 1. Put a handful of ice cubes and a cup of water into a big bowl or basin. Place 2 or 3 pots or frying pans with long handles sticking out over the counter. Place newspapers on the floor to catch sugar drips. Wear an apron. 2. Put sugar, corn syrup and water into a small pot and let simmer (medium fire) without stirring. After about 15 minutes, the sugar will turn light golden and syrupy. If you have a candy thermometer, it should reach 310 F. Remove and plunge the pot into the prepared bowl of cold water to stop the cooking. The sugar will thicken further upon cooking. 3. Dip a fork into the sugar syrup, draw the fork over the handles of the pans to and fro. At first the strands will be very thin and wispy. After a while, the sugar strands will build up. You can re-heat the sugar if it gets too thick to spin. When done, lift the spun sugar off the handles and wrap it around the panna cotta. Spun sugar hardens quickly so it will break easily. 4. 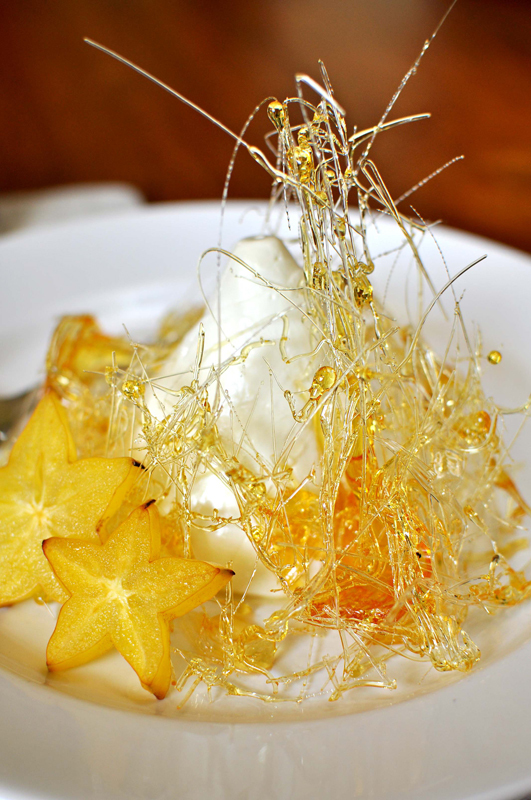 Serve the panna cotta with tartish fruits such as starfruit,oranges and strawberries and the caramel sauce (the spun sugar is too hard). Voila! A show stopper! Super silky coconut panna cotta. I had re-heated the spun sugar for the second nest so there was no spun sugar to eat with the panna cotta (it would be too hard anyway) but luckily, I found gula melaka syrup in the fridge. I am blown away by your creativity! Hey you did it and it looks fantastic! Lovely!! I love the addition of the sugar nest! This is so attractive, brought the panna cotta to a whole new level! Amazing job and creativity. what a pretty golden plate of dessert! elegant yet simple. bringing your creations to a whole new level! I must say that of all your jelly mold recipes, this one is DA BEST!!! Bravo for the sugar nest. I'm always a little cautious about working with heat so seeing you tackle this for the first time is very inspiring. looks great sugar nest. have seen it on masterchef australia and it looks difficult but you made it. since you said If you've never made panna cotta, make it! It's the yummiest easy dessert to make..so i want to try coz i know your recipes are proven to be doable... just wondering, where can i find gelatine leaves? if i use gelatine powder, how much do i use. the caramel sauce is to be poured over the panacota and eaten together is it? Wish i can take some of your panna cotta at the last photo, YUM! Bravo on the sugar nest! ann: tq:) it tasted great too! elsie: oh dear. what am i going tomake next?! boo: oh u must try working with sugar. i think many times we think something is hard bc we haven't tried it whenonce we did we know it's not hard at all! anon: yes yes thanx for pointing out the caramel sauce part. i've included tt in the recipe. if you live in kk, u can get gelatine leaves in pelangi cake ingredients shop in luyang. write me if you want the address n phone no. sonia: :))) it really was very very yum. do make it soon! Again you amazed me with your spun sugar!!! i also would like to give a try to do it..but same like you i dunt have the thermomtr.But lookin at your creation..Thank you for the encouragement! This is like fireworks jelly! Brilliant! wow.... what do you not do???? Imaging making a sugar nest? Wow this looks very nice! I'm going to send to my aunt this post 'cause she loves cook and prepares different kinds of recipes so I'm sure that she will be glad to prepare this. Thanks. These 3 researches from major medicinal journals are sure to turn the conventional nutrition world around!